If you think that eMule is throttled on your network, you should enable this function. 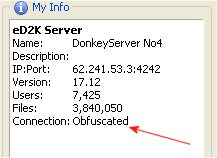 Whenever possible eMule will use obfuscated connections and will ask other clients to do the same when connecting to your client. When connecting to a server, eMule will try to establish an obfuscated connection first and only if this fails choose a normal one. There are in general no disadvantages by using this option, except insignificant higher CPU usage and very few bytes more overhead, so you can't really do anything wrong by enabling this setting. If you enable this option, eMule will only establish and accept obfuscated connections. Clients which do not support obfuscations are ignored, incoming plaintext connections rejected and the automatic server connect will only allow obfuscated connections to a server. You should only choose this setting if you know that the ED2K Protocol is completely blocked on your network, otherwise you will loose sources and therefore slow down your eMule. However if you know that eMule is blocked, then enabling this option is recommended, because it saves connection tries which are guaranteed to fail and therefore would waste time, overhead and resources. If for some reason you want to disable the whole obfuscation feature completely you can choose this option. In general for most users there is no reason nor advantage in doing this. You can see if another client supports obfuscation by opening the Client Details dialog and check the Obfuscation line. "Supported" means that this client supports obfuscation, but it won't be used (for example because you both choosed not to in your settings), while "Enabled" means that the other client supports it and it will be used when connecting to (or from) him. Sometimes you will see a key symbol on the icon of a client as shown above. This means that there exists an obfuscated connection to this client at the moment. If there is no key, this doesn't mean he doesn't support obfuscation - he might be just not connected to you at this time. When you are connected to a server, the MyInfo box informs you, if you use an obfuscated connection or not.